As I sit here enjoying my third bottle of Bell's Octoberfest beer (not in a row), I have to express my enthusiasm for this malty beer. When I used to give beer tours, there were two points I tried to make clear. First, beer is like milk in that it has to stay cold, doesn't like light, and freshness really counts. Beer will expire. Second, beer is like fresh bread. It's made from wheat and at its best, malty style beers are like bread right out of the oven. That's what I taste in Bell's. Octoberfest beers or as the Germans would write, Oktoberfest, may be misunderstood. The festival actually starts in September and finishes in October. It was the celebration for a king's marriage or was it a horse race? The details vary depending on your source. It may have been a marriage ending with a horse race. The festival runs 16 days or so. The beers served at Oktoberfest are all lagers and therefore the fruity and hoppy flavors are not as prevalent. While Oktoberfest is traditionally a lager, not an ale, many US craft breweries go with an ale style beer because they are set up to brew ales and not lagers. Lagered beers require more storage and time in tank. What I really dig about the Bell's is that unlike his other hoppy and fruity ales, this one really emphasizes the malt of a great lager and shies away from the fruity esters of some ale yeast strains. Without getting too technical, the brewer can use different ale strains to emphasize or de-emphasize the fruity flavors of an ale. A lager is brewed with a different yeast and typically does not show fruity flavors. I think it's an excellent example of a German Lager from a brewery that mainly produces ales. It is fresh bread in a glass. As I am a hop head, but enjoy all great beers, Bell's Octoberfest is a nice change of pace to the malty side of life. 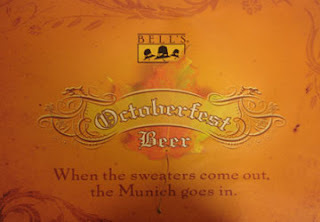 Bell's is difficult to find this year, but other Octoberfest beers are around if you can't find this one. Remember to always drink your beer from a glass. It really tastes better than from the bottle.